Deposition of the unconformity-bounded sequence comprising the Great Artesian Basin in eastern Australia occurred in the Upper Zenithic phase as classified by the biblical geological model proposed previously by Walker. Relevant characteristics for classification include the continental scale of the structure and the presence of fossils, particularly fossil footprints. Classification was assisted by the fact that the structure has experienced minimal disturbance and significant erosion since deposition. The presence of flat-topped landforms in the thickest part of the sequence is also a significant factor assisting classification. The rocks of the Great Artesian Basin, Australia, have characteristics which make them easy to classify within a biblical geological framework. Covering a large area of eastern Australia they will provide a useful benchmark for further creationist geological work. Figure 1. Walker’s biblical geologic model. The geological framework used for classification is shown in Figure 1. Walker1 has described the concept of the model and proposed a number of criteria by which geological structures may be classified. These ideas have been amplified and applied to the basement rocks of Brisbane, Australia.2 The method of classification involves a process of elimination based on significant characteristics relevant to the biblical model and the geological structure under consideration. The Great Artesian Basin is the largest artesian basin of its kind in the world,3 occupying a flat depressed area of eastern Australia as illustrated in Figure 2. The basin is known from extensive drilling for artesian water, which is held under pressure in porous sandstone aquifers overlain by impervious shale aquicludes. When the pressure is relieved by boring through the shales into the sandstones, artesian water flows to the surface, often in great quantities and quite hot. The aquifer sandstones can be traced across the basin from the eastern margin where they are exposed. In the deeper parts they are over 2,000 m below the surface. Figure 2. Areal extent of the Great Artesian Basin, comprising the following sub-basins: (1) Eromanga Basin; (2) Surat Basin; (3) Moreton Basin; (4) Clarence Basin; (5) Carpentaria Basin (6) Laura Basin. Section along line A–A’ is shown in Figure 4. In the past, European settlement of the arid, inland centre of Australia has relied extensively on the artesian water obtained from the basin. In more recent times significant reserves of coal, oil and gas4 have been discovered, prompting ongoing drilling programmes to understand the geology. The stratigraphic units comprising the Great Artesian Basin sit conformably upon each other, but the whole sequence is bounded below and above by unconformities. Table 1. A classification for the scale of geological structures. The aerial extent of the Great Artesian Basin exceeds 1,800,000 km2 covering a significant portion of the Australian continent as shown in Figure 2.9-12 Also indicated on the figure are the locations of its component sub-basins, the largest of which is the Eromanga Basin. To the north is the Carpentaria Basin and the smaller Laura Basin. In the south-east is the Surat Basin, the Moreton Basin and the Clarence Basin. Figure 3. Simplified stratigraphic relationships and correlation of the Great Artesian Basin. The location of the sub-basins is indicated in Figure 2. The structure of the Great Artesian Basin has been delineated through geological surface mapping and from wells drilled for water, coal, oil and gas. The formations comprising the basin have been correlated lithostratigraphically across its vast geographical extent. Figure 4. Generalised east-west cross-section of the Great Artesian Basin along line A–A’ shown in Figure 2. Note the extreme vertical exaggeration. The horizontal grid on the cross-section corresponds to the 1:250,000 scale geological map grid. Locations indicated by arrows are within 100 km of the line of cross-section. Figure 3 is a simplified version of the correlations published by Day et al.15 who list the named stratigraphic units within each sub-basin and show how the units relate to each other. The Winton Formation of the Eromanga Basin is shown as the uppermost unit of the Great Artesian Basin sequence and is exposed over a large area of central Queensland. A number of units are recognisable from basin to basin. These include the Wallumbilla Formation which is encountered in the Surat, Eromanga and Carpentaria Basins and also in the Laura Basin at the base of the undifferentiated Rolling Downs Group. The Birkhead Formation is recognised in the Eromanga and Surat Basins, and its facies equivalent, the Walloon Coal Measures, extends to the Moreton Basin. Distinctive, widespread units toward the bottom of the sequence are the Hutton Sandstone, the Evergreen Formation and the Precipice Sandstone. There are continuous lithostratigraphic connections across the whole area. Table 2. Classification of continental scale rocks within the biblical geologic model of Walker. Because the basin is of continental scale it would not have been deposited during the Lost-World or New-World eras; that is, the Modern, Residual and Lost-World phases as shown in Table 2. The expected intensity of geological processes experienced during these eras would be similar to the intensity of geological processes operating at present. These would produce only local or perhaps regional-scale structures in the time available. The formation of continental-scale structures would also be unlikely during the Dispersive phase of the Flood event. Although the volume of water flowing from the continents at this time would be considerable, it is expected that deposition would tend to be of regional and local scale from dispersed watercourses. The early Recessive stage of the Flood event, the Abative phase, may involve continental-scale structures as the waters flowed off the continents in large coherent sheets of wide geographic extent. These would tend to be at the edges of the continent. Continental-scale structures would be consistent with deposition during the Creation event, particularly during the Formative stage. To raise the Lost-World continents above the waters covering the Earth at the time would involve continental-scale geological processes and result in continental-scale geological structures. By the same reasoning continental-scale structures would be expected during the Inundatory stage of the Flood event when continental-scale geological processes flooded the continents with water. Table 3. Classification of fossils within the biblical geologic model of Walker. By identifying the Great Artesian Basin as a continental-scale structure, the number of possible phases of the biblical geological model where the units could be classified has been narrowed. However, there is still a range of uncertainty, and other criteria must be considered to get more specific. As summarised in Table 3, the presence of fossils rules out deposition during the Creation event because life had not been created. (Only tiny marine planktonic organisms would be anticipated for the Biotic phase, not the diverse range of creatures listed above.) What remains are the Inundatory stage and the Abative phase of the Flood event. Figure 5. Part of a plan of dinosaur footprints at Lark Quarry, near Winton, central Queensland. (A) Large tracks attributed to a carnosaur—a large representative of the Theropoda. (B) Tracks attributed to an ornithopod. (C) Tracks attributed to a coelurosaur—a small representative of the Theropoda. Well-preserved dinosaur footprints are also reported toward the top of the stratigraphic sequence in the Winton Formation at Lark Quarry, a site 120 km southwest of Winton in central Queensland.37 Excavations in 1976 by a large labour force of volunteers revealed several thousand footprints representing the trackways of well over 100 bipedal dinosaurs, many of them apparently no bigger than chickens. 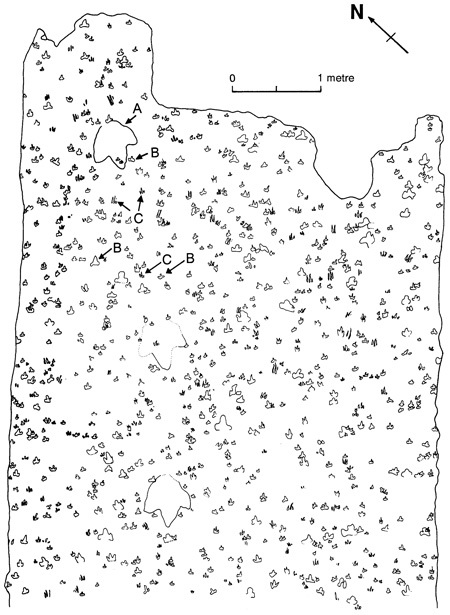 Part of a plan view of the footprints is reproduced from Thulborn and Wade38 in Figure 5. A thick overburden of sandstone needed to be broken up by jack-hammers and levered out with crowbars to expose the footprints. In all some 60 tons of overburden was removed. It was then necessary to clean the footprints by removing the sandstone which filled them. Footprints have been uncovered at three locations spanning some 200 m, and all appear to be at the same stratigraphic level. This strongly suggests that the footprints are part of the Winton Formation itself. The presence of footprints is important because it rules out the Recessive stage of the Flood event as shown in Table 4. The Bible records that “Everything on dry land that had the breath of life in its nostrils died” (Genesis 7:22). This would have included dinosaurs, because even if they were amphibious and comfortable in shallow, near-shore waters, the strong deep currents of the Flood would have overwhelmed them. This is suggested as the explanation for many dinosaur graveyards in North America,39 and is doubtless the cause of their mass extinction. Table 4. 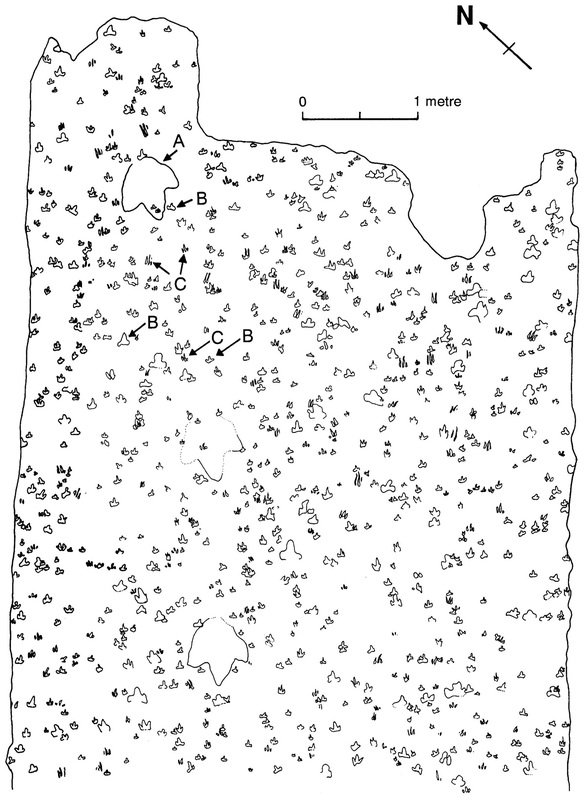 Classification of footprints within the biblical geological model of Walker. The sediments which comprise the Great Artesian Basin generally display only minimal disturbance. Strata of the Moreton Basin are characterised by gentle dips. Unusually steep dips are related either to disruption caused by emplacement of later intrusives or to post-depositional normal faults generally along old fault planes.40 Sediments of the Surat and Eromanga Basins are only gently deformed.41 All basins show evidence of post-depositional faulting. In general terms, the strata of the Great Artesian Basin are “undeformed and subhorizontal”,42 making it relatively easy to correlate distinctive members across the majority of the structure. Given that the Flood involved global crustal movement in association with the breaking up of the foundations of the deep, minimal disturbance favours deposition late in the Flood when crustal movements were in decline after peaking in the early phases of the event. Recalling that the Recessive stage has been eliminated because of fossil footprints, the latest possible phase is the Zenithic, as summarised in Table 5. Deposition during the Ascending phase may have been possible, but the Eruptive stage is unlikely. Table 5. Classification of minimal disturbance within the biblical geologic model of Walker. Figure 6. The Recessive stage of the Flood illustrating the significance of erosion patterns of sediments and flat-topped landforms. Note the extreme vertical exaggeration. (a) Stagnate water at the end of the Zenithic phase sits on sediments deposited on the continent during the Inundatory stage of the Flood. (b) Sediment is eroded to the right as water commences flowing from the continent during the Abative phase. To the left the water is still stationary. (c) The flat-tops on the landforms to the left represent the uppermost sediments deposited during the Zenithic phase. Erosion to the right indicates the path of the receding water and exposes sediments deposited earlier in the Inundatory stage. For sediments deposited during the Zenithic phase of the Flood, post-depositional erosion can provide clues to the relative timing. Genesis 7:19 records that the waters “rose greatly on the earth, and all the high mountains under the entire heavens were covered.” Figure 6(a) depicts the water covering a continent at the beginning of the Recessive stage. Sediment deposited immediately prior (during the Zenithic phase) is shown as horizontal strata beneath the water. During the Recessive stage the waters moved off the continents into the present ocean basins. This was a highly erosive process. It was also a selective process. As the ocean basins began to sink, flow would commence from the edges of the continents as illustrated in Figure 6(b). In the interior the water would initially remain stationary. Recently-deposited surface-sediments would be more vulnerable to erosion than deep-sediments deposited earlier. In addition, sediments near the edges of the continent would be eroded by the fast-flowing water, while sediments under the stationary water would not be disturbed. When the water had completely receded from the continent the resultant landforms would be as illustrated in Figure 6(c). The erosion profile provides guidance to the relative timing of the sediments. Limited erosion (as to the left of the figure) indicates sediments formed late in the phase. Significant erosion (as to the right of the figure) indicates sediments deposited early in the phase. The effect of this erosion is illustrated in the cross-section in Figure 4. At the edges of the basin, and to the east of centre where the strata have been pushed up, it can be seen that the stratigraphy is cut by the land erosion surface. Because of the large vertical scale exaggeration, the angle at which the strata are cut is distorted in the figure. In reality the angle at which the sediments are intersected by the land surface is very small. Material has been removed in large sheets across the whole structure. In the western and central parts of the basin the uppermost Winton Formation shows evidence of widespread sheet erosion. The quantity of material removed is unknown. In the Brisbane area to the east, erosion has exposed the Walloon Coal Measures and part of the Bundamba Group in the lower parts of the structure, with the removal of more than 1,000 m of material. Here erosion is confined in area but extends deeper. Table 6. Classification of significant sheet erosion within the biblical geologic model of Walker. Such bevelling of the Great Artesian Basin is consistent with erosion of sediments by the receding Flood waters. Initially, during the Abative phase, erosion would occur in broad, flat sheets, as is preserved in the western and central part of cross-section shown in Figure 4. Later during the Dispersive phase as the volume of water gradually decreased, erosion would be confined to the established channels. One such channel can be seen in the eastern part of the cross-section in Figure 4, between Toowoomba and Brisbane where the Brisbane River now flows in a wide deep valley apparently cut during the Dispersive phase. It is expected that the watercourses active during the Dispersive phase would be similar to the drainage systems that exist today. The significance for classification is summarised in Table 6. 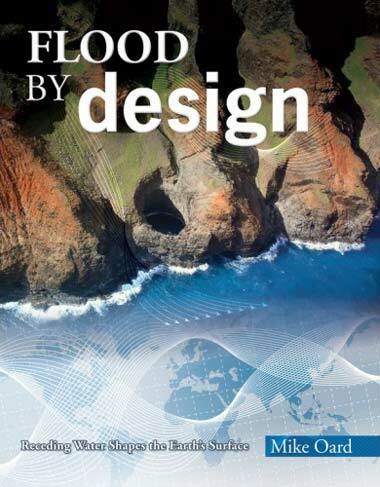 Such erosion is not consistent with deposition during the Abative or Dispersive phases, because sediments deposited during these phases would not be exposed to the widespread erosive effect of the receding Flood waters. Erosion also indicates that the top of the Zenithic phase is not preserved, at least in those sediments which are eroded. Deposition could have occurred early in the Zenithic phase or perhaps during the Ascending phase. The erosion characteristics observed are not consistent with deposition during the Eruptive phase. Another consequence of the erosive patterns associated with the Recessive stage of the Flood is the formation of flat-topped structures, such as plateaus, mesas and buttes, at the same stratigraphic level where sediment bedding has remained essentially horizontal. Such structures would occur in Zenithic phase sediments with the flat-top representing the end of the phase. Figure 6, which illustrates the hydraulic processes operating during the Recessive stage, shows how flat-topped structures would form from horizontal beds. 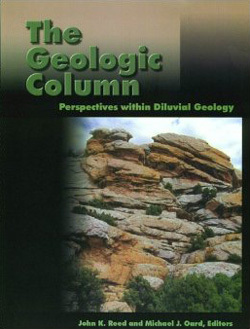 Flat-topped structures with bedding at the same stratigraphic level would tend to occur in the middle of the continent where the water remained stationary. It would be possible for flat-topped structures to form at any time during the Flood whenever tectonic action emptied a depositional basin of water. However, those formed at the top of the Zenithic phase and during the Abative phase would be most widespread and would have the best chance of being preserved. Being deposited late in the Flood, they could not be hydraulically destroyed once the continents were free of water. Those formed during the early phases of the Flood would most likely be disturbed, tilted and eroded during the subsequent tectonic and hydraulic processes. It is noteworthy that these landforms are found within the Surat Basin where, as indicated in Figure 4, the thickest part of the sequence is preserved. Table 7. Classification of flat-topped landforms within the biblical geologic model of Walker. As summarised in Table 7, the presence of flat-topped landforms in the Surat Basin area suggests that these surfaces represent the very top of the Zenithic phase. Elsewhere on the Great Artesian Basin the uppermost sediments of the sequence have been eroded by the receding Flood water to reveal earlier deposited strata, forming a gently undulating rolling downs topography. Such characteristic topography has been incorporated in its stratigraphic name—the Rolling Downs Group. The classification of a unit needs to be consistent with its relationships to other geological units. However, the flat landforms of the Great Artesian Basin are almost perfectly flat with horizontal to sub-horizontal bedding.52 If they are the end point of a very long erosional process, where have the vast quantities of eroded sediments gone? Rather than the end point of a long erosion process, it would appear that the flat-topped landforms are the starting point. The simple Flood model shown in Figure 6 better accounts for the observed topography than the concept of long periods of erosion. Flat-topped landforms are simply explained as the product of a depositional process rather than an erosional process. The classification of a unit needs to be consistent with its relationships to other geological units. The Great Artesian Basin extends to the Brisbane area, where it overlies the basement rocks which have previously been classified as Eruptive phase.53 Provided the Great Artesian Basin is classified later than Eruptive phase it will be consistent with the basement rocks of the Brisbane area. The Great Artesian Basin also overlies other major sedimentary basins in Queensland, including the Galilee Basin, the Bowen Basin, and the Cooper Basin.54 Late deposition is required by these relationships. Classification as late Ascending or Zenithic phase would be acceptable. Table 8. Summary of the classification of the Great Artesian Basin within the biblical geologic model of Walker. X marks phases eliminated as a possible time for the formation of the rocks on the basis of the classification criteria shown. ? marks phases which are questionable. Table 8 summarises where the Great Artesian Basin, Australia fits geologically within the biblical geologic model. The fact that the structure is of continental scale restricts the possibilities to the Creation or Flood event. However, the Creation event is eliminated by the presence of fossilised plants (such as coal) and animals. The Recessive phase of the Flood event is eliminated because dinosaur footprints are found in a number of locations within the strata forming the basin. This leaves the three Inundatory phases from which to select. The presence of significant post-depositional erosion over the surface of the structure similarly indicates deposition late in the Inundatory stage. Because the structure has only experienced minimal disturbance, deposition must have occurred when crustal movement was in decline late in the Inundatory stage—the Zenithic phase or perhaps the Ascending phase. The presence of significant post-depositional erosion over the surface of the structure similarly indicates deposition late in the Inundatory stage. In addition, those parts of the structure which have an erosion surface could not have been deposited at the very top of the Zenithic phase. However, the presence of flat-topped landforms, such as plateaus, mesas and buttes in the thickest preserved part of the sequence, Surat Basin area, suggests that this flat-topped land surface represents the very top of the Zenithic phase. The uppermost strata of the Great Artesian sequence, the Griman Creek Formation in the Surat Basin, fits at the top of the Zenithic phase. The remainder of the structure would therefore have been deposited earlier during the upper Zenithic phase. As more of the geology of an area is classified within this model we will begin to appreciate the relative volumes of sediment associated with different phases and form better estimates of the time involved. 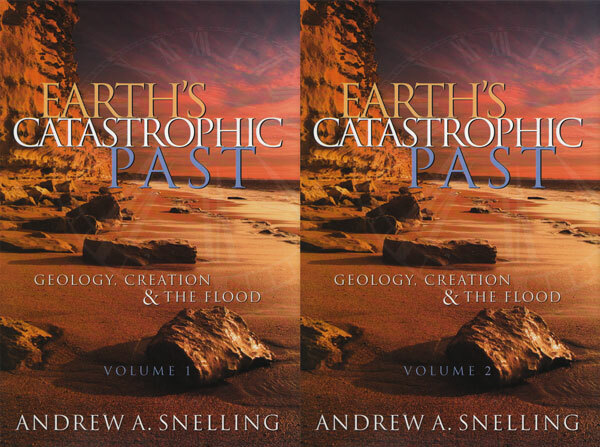 What geological evidence in our world today supports events mentioned in the Bible such as a global flood? Walker, T.B., A biblical geologic model; in: Walsh, R.E. (ed. ), Proceedings of the Third International Conference on Creationism, Creation Science Fellowship, Pittsburgh, Pennsylvania, pp. 581–592, 1994. Return to text. Walker, T.B., The basement rocks of Brisbane, Australia: Where do they fit in the creation model? J. Creation (CENTJ) 10(2):241–257, 1996. Return to text. Ludbrook, N.H., A Guide to the Geology and Mineral Resources of South Australia, Department of Mines and Energy, Adelaide, South Australia, p. 37, 1980. Return to text. Parkinson, G., Atlas of Australian Resources: Geology and Minerals, Australian Surveying and Land Information Group, Canberra, ACT, pp. 50–53, 1988. Return to text. Davison, G.E., The importance of unconformity-bounded sequences in Flood stratigraphy, J. Creation (CENTJ) 9(2):223–243, 1995. Return to text. Davison, Ref. 5, p. 227. Return to text. Davison, Ref. 5, p. 229. Return to text. Davison, Ref. 5, p. 240. Return to text. Ludbrook, Ref. 3, p. 37. Return to text. Day, R.W., Whitaker, W.G., Murray, C.G., Wilson, I.H. and Grimes, K.D., Queensland Geology: a Companion Volume to the 1:2,500,000 Scale Geological Map (1975), Geological Survey of Queensland, Publication 383, Brisbane, p. 25, 1983. Return to text. Parkinson, Ref. 4, p. 11. Return to text. Parkin, L.W. (ed. ), Handbook of South Australian Geology, Geological Survey of South Australia, Adelaide, inside front and back covers, 1969. Return to text. Exon, N.F., Mitchell, Queensland: 1:250,000 Geological Series, Bureau of Mineral Resources, Geology and Geophysics, Canberra, p. 10, 1971. Return to text. Day et al., Ref. 10, p. 135. Return to text. Day et al., Ref. 10, correlation charts. Return to text. Cranfield, L.C, Schwarzbock, H. and Day, R.W., Geology of the Ipswich and Brisbane 1:250,000 Sheet Areas, Geological Survey of Queensland, Report 95, Brisbane, map, 1976. Return to text. Mond, A., Dalby, Queensland: 1:250,000 Geological Series, Bureau of Mineral Resources, Geology and Geophysics, Canberra, map, 1973. Return to text. Reiser, R.F., Surat, Queensland: 1:250,000 Geological Series, Bureau of Mineral Resources, Geology and Geophysics, Canberra, map, 1971. Return to text. Exon, Ref. 13, map. Return to text. Galloway, M.C., Augathella, Queensland: 1:250,000 Geological Series, Bureau of Mineral Resources, Geology and Geophysics, Canberra, map, 1970. Return to text. Galloway, M.C., Adavale, Queensland: 1:250,000 Geological Series, Bureau of Mineral Resources, Geology and Geophysics, Canberra, map, 1970. Return to text. Gregory, C.M. and Vine, R.R., Windorah, Queensland: 1:250,000 Geological Series, Bureau of Mineral Resources, Geology and Geophysics, Canberra, map, 1969. Return to text. Gregory, C.M. and Vine, R.R., Canterbury, Queensland: 1:250,000 Geological Series, Bureau of Mineral Resources, Geology and Geophysics, Canberra, map, 1969. Return to text. Jauncey, W., Betoota, Queensland: 1:250,000 Geological Series, Bureau of Mineral Resources, Geology and Geophysics, Canberra, map, 1965. Return to text. Olgers, F., Birdsville, Queensland: 1:250,000 Geological Series, Bureau of Mineral Resources, Geology and Geophysics, Canberra, map, 1964. Return to text. Williams, A.F. and Youngs, B.C., Poolowanna, South Australia: 1:250,000 Geological Series, Geological Survey of South Australia, Adelaide, map, 1975. Return to text. Kreig, G.W., Dalhousie, South Australia: 1:250,000 Geological Series, Geological Survey of South Australia, Adelaide, map, 1985. Return to text. Rogers, P.A., Abminga, South Australia: 1:250,000 Geological Series, Geological Survey of South Australia, Adelaide, map, 1986. Return to text. Walker, Ref. 2. Return to text. Cranfield et al., Ref. 16, pp. 61–67. Return to text. Willmott, W. and Stevens, N., Rocks and Landscapes of Brisbane and Ipswich, Geological Society of Australia, Queensland Division, Brisbane, Queensland, pp. 21–22, 1992. Return to text. Day et al., Ref. 10, pp. 130–132, 138–139. Return to text. Cranfield et al., Ref. 16, p. 65. Return to text. Anonymous, The footprints of history, Queensland Government Mining Journal, 90(1054): Back cover, Brisbane, October 1989. Return to text. Willmott and Stevens, Ref. 31, p. 22. Return to text. Thulborn, R.A. and Wade, M., Dinosaur trackways in the Winton Formation (mid-Cretaceous) of Queensland, Memoirs of the Queensland Museum 21(2):413–517, 1984. Return to text. Thulborn and Wade, Ref. 37, enclosed plan. Return to text. 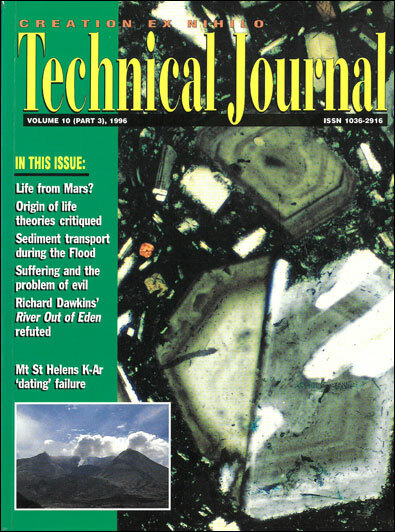 Oard, M.J., Polar dinosaurs and the Genesis Flood, Creation Research Society Quarterly 32(l):47–58, 1995. Return to text. Day et al., Ref. 10, p. 125. Return to text. Day et al., Ref. 10, p. 31. Return to text. Mond, Ref. 17, pp. 15–16. Return to text. Day et al., Ref. 10, p. 136. Return to text. Exon, Ref. 13, p. 15. Return to text. Reiser, Ref. 18, p. 5. Return to text. Resier, Ref. 18, p. 5. Return to text. Exon,N.F., Roma, Queensland: 1:250,000 Geological Series, Bureau of Mineral Resources, Geology and Geophysics, Canberra, p. 16, 1971. Return to text. Gregory and Vine, Ref. 22, p. 4. Return to text. Press, F. and Siever, R., Earth, Fourth edition, W.H. Freeman and Company, New York, p. 145, 1985. Return to text. Mond, Ref. 17, p. 16. Return to text. Day et al., Ref. 10, p. 25. Return to text. Walker, Ref. 1. Return to text.